Queens Park Rangers chairman Tony Fernandes has cooled rumours of an audacious move for want-away Manchester City star Carlos Tevez. Mega-rich Rangers are set to invest heavily in their playing squad during the January transfer window as they aim to avoid Premier League relegation. 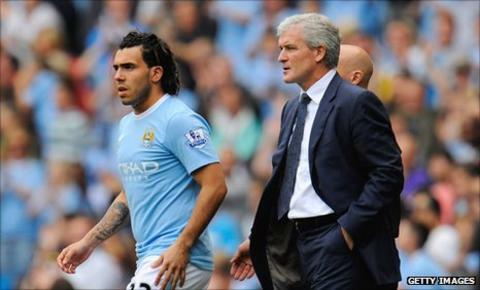 Tevez played under new boss Mark Hughes at City, while the Argentine's advisor Kia Joorabchian is also Hughes's agent. "You never know - but it's highly unlikely," Fernandes told 5 live. "He's one of the most highly-paid players in the Premier League and I think his mind is to go to another country." But Fernandes, who completed his takeover of the west London club just days before the August transfer window closed, wants to bring in fresh blood immediately. Rangers currently sit fourth-bottom of the Premier League having failed to win in their last eight matches. "I would like to do business as soon as possible," said the 47-year-old. "We have been affected by the African Cup of Nations, the suspension of Joey Barton and the injury blow for Ale Faurlin. "But we've got to make sure we get the right people at the right price. "We've still got 20 days, which is a luxury. We had seven days last time." Fernandes plans to discuss transfer targets with Hughes, who was announced as Neil Warnock's replacement on Tuesday, following the Welshman's first training session on Wednesday morning. The Malaysian businessman describes former Fulham boss Hughes' appointment at Loftus Road as a "match made in heaven". "He had a burning ambition to prove to the world what he was capable of," added Fernandes. "He saw our ambition as well. Money cannot buy ambition. "So it was one plus one equals two and that's where we went."